Norfolk: Roadtrip for plums plus Fakenham and cake! 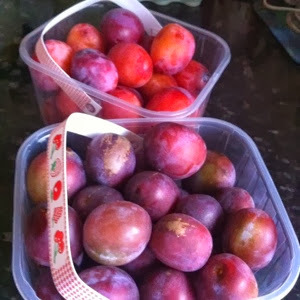 Having cooked and eaten spiced plums* yesterday we were keen to buy some more plums! A few years ago we bought some at Plumbe & Maufe so after checking their website that's where we headed. We left with a punnet of Victorias (top) and Anna Spath (bottom) and plums (like runner beans) are late this year. Lucky us! 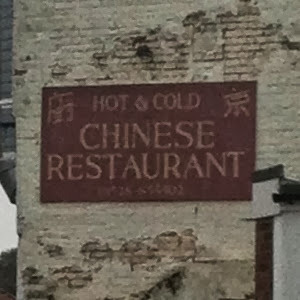 I wonder if they get many takers for cold Chinese? Anyway, back in the car we headed to Walsingham and stopped off at the barns for a mooch around the studio, carpet shop and a bit of cake. 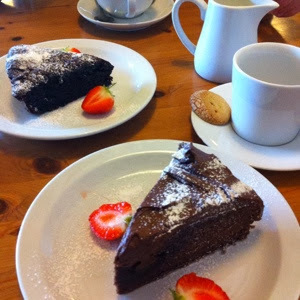 Today's cake was chocolate, beetroot and coffee (top) for MOH and chocolate fudge cake for me. Yum! Tomorrow the plan is to walk to the pub for lunch - such a tough life! 1. Put the sugar, water and spices into a saucepan and stir until the sugar has dissolved. 2. Add the plums and damsons and bring to the boil. 3. Lower the heat, scrunch up a piece of baking parchment (or greaseproof paper). Unscrunch it and use it to cover the fruit and syrup. Cook until the fruit is tender.